Sometimes indie game developers really impress me with their rampant creativity. This week, for example, we have a surprisingly deep strategy game from Chronic Logic that looks like it was stolen from 1992 (which is good! 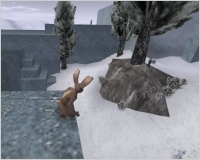 ), a fighting game starring rabbits, an unfairly tough platformer called Love, and a physics-based racing motocross racing game. When "Hey, I have a neat idea!" is the driving force behind a game, you know you're in for a good time. 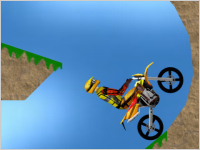 X-Moto (Mac/Windows/Linux, 24MB, free) - Perhaps a distant cousin to Line Rider, X-Moto is an open source 2D motocross platform racing game with a heavy emphasis on physics. Use the [left] and [right] arrow keys to lean and the [up] key to move forward, then try and make it through the countless user-generated tracks available online. Keep your head from crashing into the ground and you should do all right! Zatikon (Mac/Windows/Linux, 27MB, demo) - A superb turn-based strategy title from Chronic Logic, Zatikon takes place on a 2D grid where units move, attack and defend much like a complex game of chess. Build your army before diving in, choosing from around 50 units (not all of which are available from the get-go) that range from long-firing archers, close-combat warriors, and tons of extremely creative characters with interesting special abilities. Then, head out onto the battlefield and lay siege to your opponent's castle. Single player versus the computer is available, along with player versus player and co-op play. I'm not afraid to admit I a lot of fun playing this game. It's easy to pick up and very addictive, especially when you start earning gold and get to unlock new army units (shapeshifters for the win!). Love (Windows, 30MB, free) - Do you like tough-as-nails platform games that punish you at every turn? The not-so-aptly-named Love is just that. You have 99 lives to run through 20 levels of spikes, pixel-accurate jumps, and dastardly traps springing out of nowhere. Memorization and trial-and-error are your only friends. Lugaru (Mac/Windows/Linux, 25MB, demo) - A third-person action game centered around one thing: awesome-looking combat. The main character, Turner, is on a quest to find those responsible for killing people in his village. He quickly uncovers a far-reaching conspiracy, however, and takes it upon himself to fight against evil to save his fellow rabbits from slavery. Instead of forcing tons of battle commands onto the player, Lugaru uses a smart context-sensitive mechanic that allows you to pull off some spectacular moves. Even if combat isn't your thing, you can be all stealthy, too. Just be smart about it. Ah, Lugaru at last gets some attention! I hope they offer it for free soon, in light of the recent announcement of the sequel-in-dev being ramped up to a new title, 'Overgrowth'. Love is crazy. I swore I had like 80 lives until I got to this laser part where you have to fall to a certain point. My lives just went dropping to 40 in 2 seconds, and 27 in another 2. Hate the fact that respawn is immediate, which means you can walk into a death trap a billion times and you won't realise. I love Lugaru, mostly for the combat system (and that really smooth jumping). I remember playing it years back.. glad to see it's still around. Err, not a clone, more of a concept... like, it's the same idea, but it's different at the same time. If you were a fan of Elastomania, you'd probably enjoy it. Lugaru is absolutely fantastic. I have the full version, and when you finish the normal game, there's loads of fan-made settings too. the best ways to do it are to throw a knife into them (though they dodge a lot), knock them over, roll over them and rip it out or to knock them over, bend down and slay them. Love is not that hard; apart from a few disappearing platforms, it's all about timing and precise jumping. Finished it with 8 lives left and got the "walking in the clouds" ending, apparently there are others. Zatikon, easy to pick up?! I downloaded it ages ago and had NO idea what I was doing. Also, after Gish and Pontifex, I kind of expect a different type of game from Chronic Logic. For Love, I can't select any of the title screen options. What's up with that? Neonaxus, I have the same problem. How did you fix it? Love is just further proof that we like a challenge that leaves us swearing, cursing, yelling, etc. because of a few pixels keep dying. Hmm, I'm a bit confused with Lugaru. I downloaded the Mac version, and it doesn't look like it actually gave me the game..just the game assets. There is a file called "Lugaru" in there when I click into enough folders, but it has no definition, so OSX doesn't recognize it. I'd expect that if I'd accidentally downloaded the PC version, except it explicitly says on the main folder that it's the "LugaruMac Folder"
zbeeblebrox, Lugaru was actually developed on a Mac, so it should definitely work. Please try downloading it from this URL: http://static.wolfire.com/games/LugaruMac.zip and see if that works. The link for X-Moto is in the review. A great weekend download, finally some good stuff that will work on my Mac! Lugaru and Zatikon are both very nice, X-Moto wouldn't run on my computer however. Lugaru could have been given a better storyline and perhaps some interface improvements, but is a very nice little game and the combat is unmatched. Zatikon is challenging, I have yet to figure out how to play it correctly. But it looks very complex and enjoyable, I will be reading those guides. Is the X-Moto site down? I can't download X Moto for some reason. Every time I try, the internet says it can't connect or something (I'm using windows Internet explorer). Maybe I'm just terrible at it, but as much as I want to enjoy Lugaru, combat is nothing more than spastic twitching. Even on the easiest setting, it seems nearly every attack I make is countered and countering or reverse countering on my part comes down to getting a lucky tap on Shift. I have the same problem too. Yesterday I tried to download from the link and it said 403 forbbiden. Yeah, the main webpage for X-Moto seems to be down for the count right now. However you can still download the game from the sourceforge.net project page. Don't worry, you guys aren't missing anything with X-Moto. One of the worst ports of a game I've ever seen. They simply got almost everything about the physics wrong (i.e. shifting your weight forward lifts the back tire off the ground). I have down loaded love, but can't seem to get the poxy thing to work. The small screen comes up, but I can only make the curser go up and down, I can't get it to actually start the game. Can someone share the controls for Love, as well as a way to make the screen bigger than a thumbnail? I can't play the game if I can barely see it, the actual playing size is smaller than the picture in the review! Okay, I kinda figured it out, the game could sure use a readme.txt file. For Love you use "A" to select on the menu. The rest you can find in "controls" and "help". Finally downloaded X Moto, it wasn't bad. No. Maybe if you put on the brakes. In this game it happens immediately while accelerating, which is physically impossible. On the site for Love...I believe it says to "try holding down directions when you exit area." I did that. I forget which level exactly...but after holding the down button while exiting I found myself in what appeared to be the Scrap Brain Zone from Sonic the Hedgehog 1. Unfortunately, I can't get out, the exit is broken. And even more weirdness, after the help screen I was back at the main menu, and when I started a new game it gave me the game over text. After that, the game started and everything was as normal. Yeah. I dunno what to say about that. Lugaru seems like the kind of game that I could really enjoy! Now, am I actually running up against the limits of the demo version, or is there only one enemy to fight in the campaign? I just run around and around and around and can't find any more! I tried talking to people and it didn't seem to trigger anything. Come across the camp and assassinate everyone, so awesome. The first kill is all right, the sentry puts up a good fight but I take him down. I can't manage to assassinate him yet since he moves around. The other ones are really bad, even if I could assassinate one rabbit the others go gang up on me. What do I do? Ah, thanks. That guy was hard to spot. So then I blew through the rest of the demo. get the attention of one of them and run away - he'll chase you, and hopefully his buddies won't notice. Also, throwing knives (face them and press q) is extremely useful for taking down an enemy without a fight - even when they're running right towards you! It got a little bit annoying though - I threw a knife into an enemy's back for an instakill, and then he fell over face-up. So I need to keep on beating his body until he falls over the OTHER way so I can pull the danged knife out. I felt pretty clever when I figured out how to "wipe off" a knife, though. *Try not to make the first move (unless it's a stealth kill). The AI is deadly good at reversals. Even jumping over their heads will make them grab you and slam you down. Instead, reverse the enemy attack and then run up for a second combo. *Knives are great when your enemies are off guard, but in straight-up combat they'll roll away from thrown knives and reverse direct attacks. I keep knives sheathed unless needed. Also, if the enemy has a knife, you will get slashed, even if you reverse the attack. *The tutorial helpfully tells you that the rabbit kick (run, hold attack, and jump) and the wall-jump kick (wall-jump while holding attack) are your most powerful moves, but good luck hitting. You earn sweet points for a direct hit, but more than likely they'll grab you in midair and slam you to the ground. Even worse, missing with the rabbit kick puts you on the ground. On the flip side, you'll get lots of practice with counter-reversals! *Try not to take on teams. Remember what I said about enemy reversals? That goes double for teams. When you hit or reverse one, the other one will hit you. Run away, wall-jump, whatever it takes to get them separated enough to kick. How do you wipe off a knife? I bought the $20 game, and it was well worth it. It has a variety of weapons, as well as the super powerful wolves to deal with. And you get to finish the quest, of course. I bought Lugaru, and it's an excellent game, with a great storyline, and amazing combat. I usually like to use stealth instead of direct fighting, because it is just plain quicker. Here are some tips for stealth. Walk while crouching, and approach them from behind. If you don't have a knife, use a Backbreaker, or whatever on them by walking up behind the enemy, and clicking. Same with knives, except you stab them. If the enemy is too far away, just throw a knife at them, if you have one. (may not work if enemy is wearing armor) Also, a staff can cause a one hit kill from behind. I also bought the alpha for the sequel to Lugaru, Overgrowth, and it's awesome. Great graphics, more moves, more weapons, and more fun!